This year's Streete Park Parish Vintage Day is set to be a very enjoyable day out with something for absolutely everyone to enjoy. 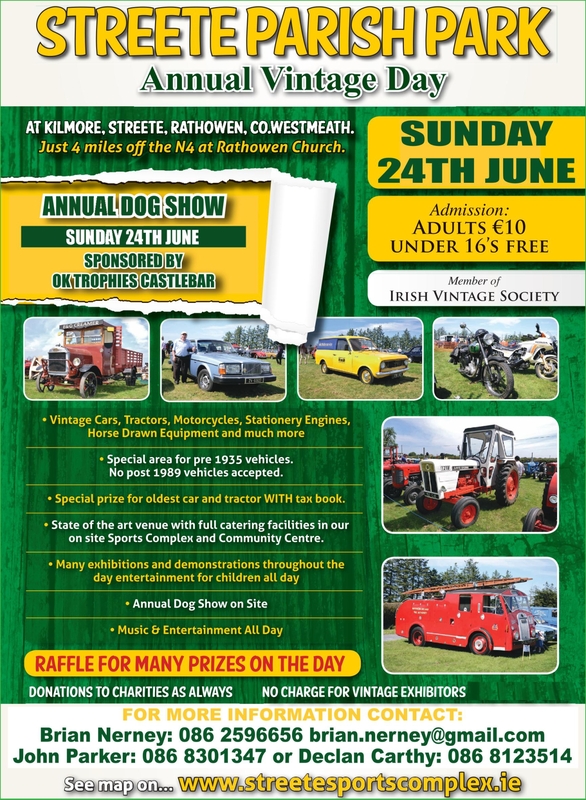 And, since the date has been changed this year to prevent the event clashing with the Mullingar Agricultural Show and Walderstown Motor Bike Racing, there's no reason for vintage enthusiasts not to head to Streete Parish Park for a day of fun activities. “It's a great family day out and there's something for absolutely everbody to enjoy,” said the committee PRO, Brian Nerney, who is looking forward to the event himself. “The dog show is always a major attraction. Judging will start at 3pm and there's a €3 entry for each class. “The mouse-racing event is always a crowd-pleaser,” he added with a laugh. “It's organised and run by our Chairman, Declan Carthy, and our Vice Chairman, James Parker,” he said. Of course, there'll be plenty of amusements for children to enjoy, as well as craft demonstrations at various times during the day. And nobody will go hungry either, as the community hall will comfortably fit up to 200 diners, with hot and cold food available. There'll also be plenty of stalls and vans with coffee, ice-cream and other treats. “Exhibitors of vintage vehicles will be looked after with a meal,” Brian explained. Musical entertainment will be provided by Olivia Douglas, who is sure to draw a large crowd, as well as some local musicians. “The most important thing is our autojumble,” Brian added. The Streete Parish Park Vintage Day takes place this Sunday, June 24. Admission is €10 for adults. Exhibitors and children under 16 go free.